It is the ultimate tool in the war on crime. The result of a billion dollars of research and possibly one or two dead interns in the Wayne Enterprises research and development labs. 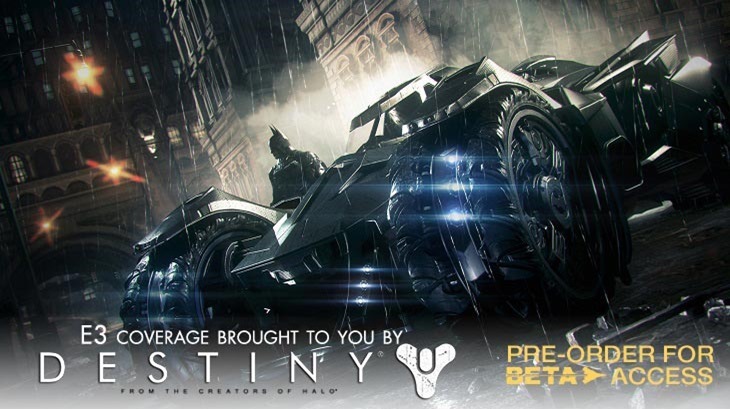 And for the first time in years, the Batmobile is once again a playable part of a Batman video game. And to put it simply, developer Rocksteady have nailed a design for the most important piece of Batman technology, translating the iconic vehicle into video game form. It’s a core part of the Batman: Arkham Knight experience, a tool with a personality all of its own. In a hands on demo that covered Batman’s new predatory, exploration and combat skills, the Batmobile had a chance to shine as it weaved its way through challenges. First of all, it’s big, loud and intimidating. The Batmobile was rendered in stunning detail, with moving parts and textures that truly made Arkham Knight feel new-gen. So how did it perform? The Batmobile is easy enough to drive. You’ve got your usual acceleration and steering mechanics, with the car feeling like it would be at home in a game such as Project Gotham Racing. But it’s the chance to spin your tires and kick in the booster that makes it feel like a badass piece of equipment. Changing it to Battle Mode is easily done by holding in the left trigger, where it quickly transforms into a mobile assault vehicle that can strafe, boost sideways and fire off several rounds at tanks and other goons before transforming back into pursuit mode. What’s more, is that the vehicle can hook itself to environmental objects, and use that horsepower to bring down walls and ramps, or even take part in a few puzzles via a remote control uplink. When Arkham Knight eventually launches, the Batmobile won’t overshadow Batman, but you’ll wonder how he ever got by without it. And why he still keeps Robin around when his crime-fighting vehicle is up to all kinds of tasks.